Tahoe Meadows is a short drive up the Mt. Rose Highway from Reno and Sparks. There is plenty of free parking (except on super-busy days) right next to the sledding slopes and snowshoe trails. If you prefer, bring cross country skis instead. Part of the area is designated for snowmobile use. Whatever your pleasure, everyone has an area in which to indulge. It would be hard to find a better place for a family outing on a sunny winter day. Tahoe Meadows is a short drive up the Mt. Rose Highway from Reno and Sparks. There is plenty of free parking (except on super-busy days) right next to the sledding slopes and snowshoe trails. If you prefer, bring cross country skis instead. Part of the area is designated for snowmobile use. 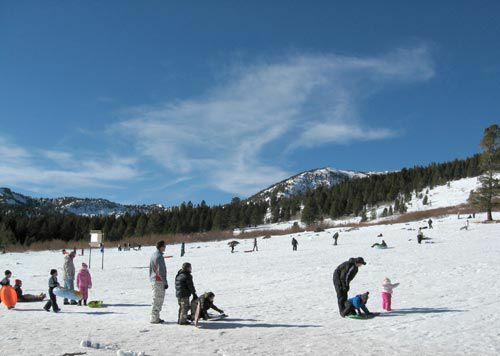 Tahoe Meadows is a fantastic snow play area. It's a short drive up the Mt. Rose Highway from Reno and Sparks. Bring your snow toys, kids, dogs, and have a blast.